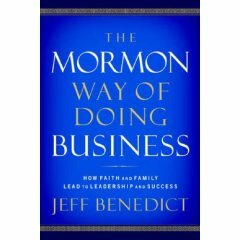 Just finished my advance copy of The Mormon Way of Doing Business (2007) by Jeff Benedict. It is subtitled "leadership and success through faith and family." The book has received a fair amount of attention: I've seen a write-up on the book in the Deseret News; a report on a panel discussion with the author and several of the CEOs featured in the book; and a long excerpt from the first chapter. [And don't miss the fine review posted at Straight and Narrow, Jettboy's blog.] So I'll keep my comments short and maybe give longer comments on one of the chapters in a later post. The book is a collection of comments and personal experiences related by eight LDS business leaders: five CEOs, a CFO, a business school dean, and a professor/consultant. But the book isn't structured as a series of biographical essays. It is organized topically, with chapters explaining how the Mormon beliefs and experience of these executives gave them the tools to succeed. More than that: how they managed to successfully balance their professional, church, and family responsibilities so ably. The chapters have titles like "On a Mission" (relating the LDS mission experience to readers, many of whom will not be LDS); "The Road Less Travelled" (about why these executives accept busy church callings despite their weighty professional duties); and "First Things First" (time management secrets to make it all work out). You, LDS reader, will probably find that the ethical and life challenges related by these CEOs sound surprisingly familiar. In many ways, the lives of wildly successful Mormons aren't much different from the lives of mildly successful Mormons. They have more energy, discipline, and motivation than the rest of us, but their values, priorities, and commitment to church and family are much like that of any practicing Mormon. The CEOs have better stories to tell, of course, which is why they are in the book and you and I are not. And because of their success in piloting large organizations, those stories and the lessons drawn from them carry some credibility. Hey, I upgraded (resurrected?) my time management routine after reading Chapter 8. This post is on my to-do list. I get to put a check mark by it now. If you work your way through the first eleven chapters — and aren't immediately impelled to run off and start a new business or begin scouting commercial investment property before finishing the balance of the book — you'll find a different sort of story in the last few chapters. September 11, 2001 was a security crisis for the country and a tragedy on a personal level for tens of thousands, but if you were a CEO with a few hundred employees near ground zero, it was also a particularly tough day at the office. Then another, and another, and another, for weeks on end. I found the hour-by-hour account of how these LDS CEOs led their companies and employees through the initial chaotic day and those that followed to be absorbing. I know this is going to come as a shock, but once again me and you are thinking of the same things. You posted yours yesterday, but I wrote mine today having thought over the subject in the middle of the week. My blog post Acumen of Mormon Business is a little less about the book and asks about what business has to do with Mormonism. Jettboy, nice post. I patched in a link to it.